Over the past 50 years, we have grown from a community of thinkers, leaders, and scholars into a destination for tech companies, startups, and successful businesses of all sizes. We value inclusion and ideas equally, because we know working together makes all of us better. We were inspired to make a video highlighting some of the faces of our growing tech and entrepreneurial organizations. In it you’ll hear about the role of small businesses and startups from Farad Ali, President and CEO at The Institute for Economic Development in Durham, Phillipe Charles of American Underground, and Christopher Gergen of HQ Raleigh. Of course, The Triangle would not be what it is without its many strong women leaders–women like Daisy Magnus-Aryitey, director of Code The Dream; Savitha Sridharan, founder and CEO of Orora Global; Alisa Herr, founder and CEO of Unity Digital Agency; Jennifer Shevach, backend engineer at Pendo; and Nan Jokerst of Duke University. 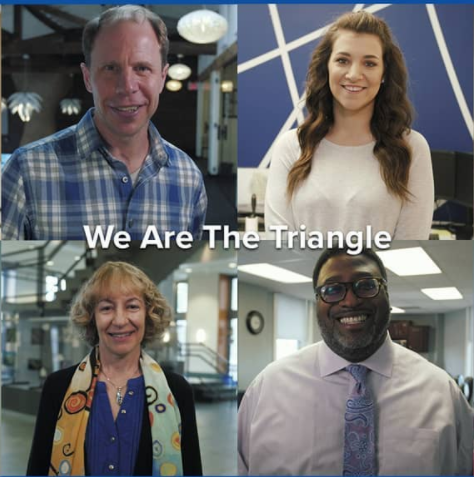 There are also several organizations that support continued growth and inclusion in our community, including Triangle Women in STEM and the Triangle Diversity Business Council. These are just a few of the many voices working to make our region welcoming to all. We Are The Triangle.